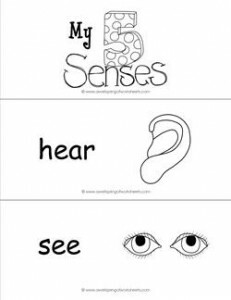 Here’s a bare and basic set of five senses vocabulary cards. Use these as an art project for the kids. They’d look great colored in crayons or colored pencils! Make your own borders, too. Please go this page to see all the five senses vocabulary cards in this set.